Like many of his contemporaries Alfred Large had an affinity with horses - It was perfectly natural therefore that Alfred should choose to go to war on horseback. Both Herbert Wilderspin and Cyril Day were already serving with the Northants Yeomanry when Alfred signed up at the age of 21 on 19-Feb-1915 (along with his pals John Taylor and Frank Hepher). The 1st Regiment of the Northants Yeomanry had mobilised with the 8th Division in Oct-1914 and in November moved to France where it took up position in the Merville-Estairs Sector remaining in this area throughout the winter. The second line regiment was raised to provide reinforcements in the field and it was in this context that Alfred was recruited. 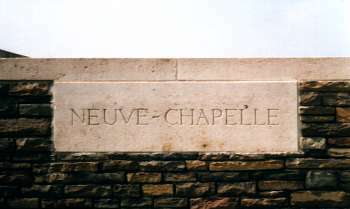 In Mar-1915 The 1st Regiment held part of the line at Neuve Chapelle (The BEF's first offensive action) suffering greviously. The Yeomen had been held ready to ride through the anticipated breech in the German line. The Northants were not given the opportunity to charge, sabres drawn, through the enemy lines in a thunder of hooves. Instead they fought dismounted in the Flanders mud using their cavalry swords along with the few spades that were available to dig out squalid scrapes in the mud as a means of escaping the incessant chatter of German machine guns. At Neuve Chappel following the loss of half of his men the Commander of the Northants when asked to attack with his remaining 300 exhausted men was reduced to a cold fury declining to participate in a needless waste of life! Alfred's father had died prior to the start of the war and during his childhood he had lived laterly with his mother and stepfather, Joseph Froment, in Market Street. His stepbrother Tom Froment served with the Grenadier Guard's Machine Gun battalion and was later wounded at Cambrai on 6-May-1918. Tom's daughter, Stella, recalls that Alfred's "step" uncle served as a military policeman throughout the war having previously been in the Met. 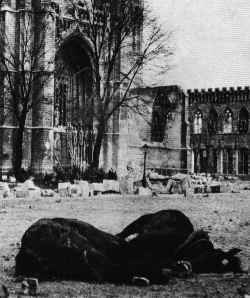 In 1915 Ypres was an appalling place. The town was gradually being demolished by artillery fire and the enemy was using mustard gas which polluted the ground and necessitated the use of gas masks and initially urine soaked handkerchiefs as a means of protection. The topography of the Ypres salient was almost totally in the enemy's favour. The defenders were enclosed by the enemy on three sides and in addition were overlooked from the surrounding high ground. The low ground was constantly waterlogged and the trenches often knee deep (sometimes waist deep) in muddy, polluted, stinking water. The engineers endeavouring to tunnel under the enemy positions at Hill 60 complained that they had to hack their way through 3 layers of dead bodies before reaching the underlying soil. Having survived these conditions Alfred succumbed to "trench fever" sometime after the Regiment transferred to the Arras sector. His illness was enough to warrant a return home but in Dec-1917 Alfred returned to the front although still not in the best of health. By mid 1917 Haig had realised (somewhat belatedly) that the war would not be won with cavalry and for that reason many of the Yeomanry Regiments were converted to Infantry. The Northants however continued as a cavalry Regiment and travelled with Plumer's force to Italy in Nov-1917. Rather than join his old regiment in Italy Trooper Large joined the Yorkshire Dragoons but quickly ended up with the West Yorkshire (Infantry). The West Yorks had fought at Passchendaele and were badly depleted. However Alfred was still not well and in Jul-1918 he strained himself whilst throwing a bomb (a hand grenade). After an operation on 22-Jul in France he was hospitalised at Ipswich. After a bout of influenza Alfred contracted pneumonia and eventually died on 29-April-1919 at Colchester military hospital. "The coffin, with Union Jack as pall, and with bayonet, cap and belt resting on top.....carried from Market Street.....the party of soldiers followed. 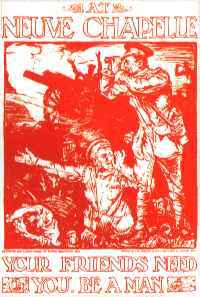 Then preceded by the firing party with arms reversed and with heads bowed.....at the close 3 volleys were fired over the grave and Sgt. Bugler Kent sounded the "Last Post". So ended the most impressive funeral in Swavesey in the memory of living man". The service was led by the Rev. Selwyn Sharp who himself had served as chaplain to "The Buffs" and the lesson read by Sgt. Wood (Headmaster of Swavesey National school). 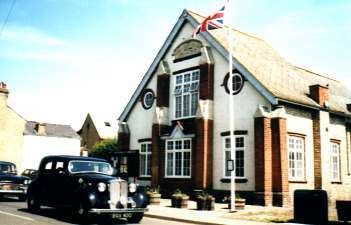 Major R. Ellis helped organise the service and in the same week represented Swavesey ex-servicemen's views at a public meeting regarding the proposed erection of a war memorial or a new village hall. Alfred Large lies in Swavesey churchyard against the wall on the Western side directly in line with the church tower. Spare a thought for him when you next pass.